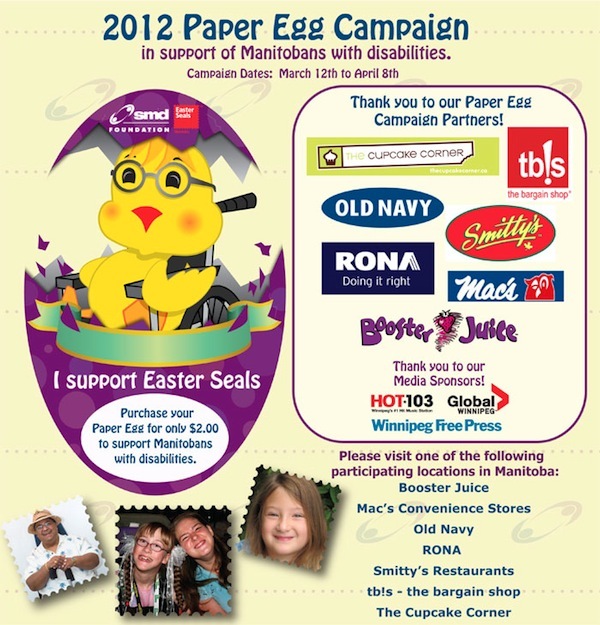 SMD Foundation/Easter Seals Manitoba is hatching its 2012 Paper Egg Campaign today to help fund programs needed to assist children, youth and adults living with disabilities. From now until April 8, participating restaurants and store retailers will be selling Paper Eggs for $2. Donors can write their name on the egg, which will be displayed at the location of purchase. Partners include RONA, Mac’s Convenience Stores, The Cupcake Corner, Old Navy, The Bargain Shop, Booster Juice, Smitty’s, TSC Stores and Money Mart.